Welcome to the LoveSac “Supersac” Giveaway! One reader will win this super comfy Supersac, including all of the accessories that you see below! I would love to lounge on this Supersac just watching TV or reading a book, and without worry if my children spilled something on it, because the cover is machine washable…AWESOME! The Fox Phur Supersac Package is the perfect seat in the house! 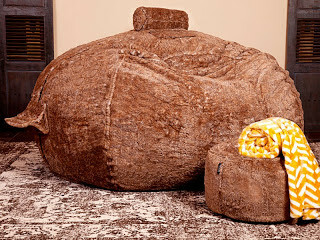 The Supersac itself is LoveSac’s most popular Sac, and for good reason. It’s obviously HUGE and seats up to three adults comfortably. This package includes the Supersac Khakisac and a Fox Phur Supersac Cover, along with all of the most popular accessories, including the Squattoman Foot Rest, Tubesac Neck Pillow, Sodasac Drink Holder and a Limited Edition Footsac Blanket. All accessories are in matching Fox Phur and the Mustard Footsac Blanket is the perfect accessory to complete the set. Not to mention the Limited Edition Storage Case with Custom Wood Enclosure Buttons and a Fabric Handle that can be used to store other household goodies!! One very lucky winner will receive the entire LoveSac Supersac Package…Valued at $900!